Pro Se Productions, an innovative Publisher of Genre Fiction, introduced the world to Jerry Kokich’s Michael Gordon in MONUMENTS OF DOOM in 2013. The Occultist now returns in a brand new collection of stories. HELL’S FURY is now available from Pro Se Productions in print and digital formats. Michael Gordon thought he had defeated his former lover turned nemesis, Aurelia DeSantis, in a climactic battle centered around murderous monuments. He was wrong... In two adventures, Michael Gordon and his old friend Olivier St. Jacques battle an ancient vampire in Italy, then find themselves lost in the Alps, where they encounter a mysterious figure in Roman armor. Author Jerry Kokich returns to tales of Michael Gordon, the Occultist in HELL’S FURY. From Pro Se Productions. 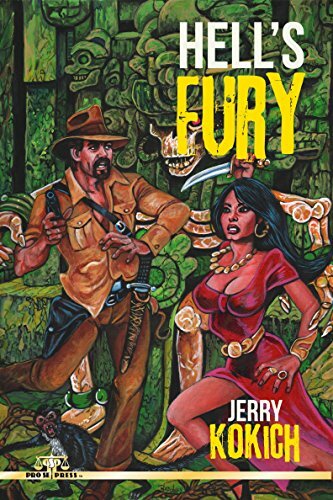 Featuring a pulpy cover by Larry Nadolsky and cover design and print formatting by Antonino Lo Iacono, HELL’S FURY is available now at Amazon at https://www.amazon.com/Hells-Fury-Jerry-Kokich/dp/1536932590/ref=sr_1_1?ie=UTF8&qid=1471627412&sr=8-1&keywords=HELL%27S+FURY+KOKICH and Pro Se’s own store at www.prose-press.com for 10.00. This trio of adventure tales is also available as an Ebook, designed and formatted by Lo Iacono for only $2.99 for the Kindle at https://www.amazon.com/Hells-Fury-Jerry-Kokich-ebook/dp/B01KP7IR7K/ref=sr_1_1?ie=UTF8&qid=1471717643&sr=8-1&keywords=HELL%27S+FURY+JERRY+KOKICH and for most digital formats via Smashwords at https://www.smashwords.com/books/view/659442 .